The Thule 867 Tahoe Rooftop Cargo Bag easily mounts to your factory-installed or aftermarket luggage rack and it can give you 15 to 17 cubic feet of extra storage space. This bag is made of water-resistant material and seams are securely taped for ample protection from the weather elements. With its internal foam padding, the bag is able to maintain its shape and protect your belongings from sudden bumps and falls. When not in use, it collapses and can be stored in its included storage bag. Durable and secure, this is the perfect companion for long vacations and road trips. This product comes with a limited lifetime warranty. 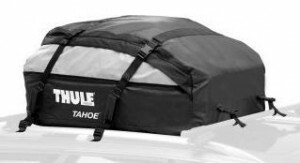 To date, the Thule 867 Tahoe Rooftop Cargo Bag has only gathered 37 customer reviews on Amazon.com. A large chunk of customer feedback is positive, with 30 reviewers praising the product for its reliability and the ease of use it offers. Not as weatherproof as they had hoped – Some customers are probably not aware of the difference between a cargo bag that is water-resistant and one that is waterproof. The Thule 867 Tahoe Rooftop Cargo Bag is advertised as being water-resistant, not waterproof. Some customers used their cargo bags through heavy rains without placing their belongings in plastic bags. Naturally, their luggage got soaked and they were understandably disappointed with the experience. Adequate Space – Most customers were pleased with the Thule 867’s storage capacity. It looks rather small out of the box, but reviewers were delighted to find upon packing that it can actually accommodate a significantly large load. Easy to install and store – Reviewers were also happy to find that the Thule 867 is quick and easy to secure to their roof racks. It’s just as easy to remove, plus, it folds neatly when not in use. Durable – Amazon users were also satisfied with how the Thule 867 looks and feels. It is well built and seems sturdy enough to give long years of service. Overall, the Thule 867 Tahoe Rooftop Cargo Bag looks like a great product. It has a large space capacity, it’s painless to install on your roof rack, and as most reviewers observed, it’s reliable and made of durable materials. Just keep in mind though that it is only water-resistant and not fully waterproof. As long as you remember to keep clothes and important belongings covered in plastic when driving in rainy weather, you should find yourself pleased with this product’s quality and performance. Why Choose A Hard Shell Car Top Carrier For Your Car? BestCarTopCarriers.com is a participant in the Amazon Services LLC Associates Program, an affiliate advertising program designed to provide a means for sites to earn advertising fees by advertising and linking to amazon.com.